On Friday I purchased a new cell phone. My old one was dying, my contract was running out … It was time. After picking through the limited selection of phone at the ATT store (island saying: “You go to the store for what you want, you come back with what they got.”), I decided on a touch-screen, slide-out keyboard model. So what does all of this have to do with cooking? “Phone for Summer” was at the top of a very long TO DO list, and most of the tasks revolved around gathering supplies to make Summer’s Secret Mango Hot Sauce and Anne’s Mango Hot Pepper Jam to take to the Mango Melee in St. Croix at the end of June. Our last foraging run ended around 3:45, giving me just enough time to prepare Baked Goat Cheese and Baked Brie, and pick up the Cheddar Cheese Biscuits for the wine tasting at Marina Market Wine and Cheese Shop in Red Hook. Afterward, we went to Latitude 18 to have dinner and enjoy some music. Peppers and other good stuff for hot sauce and jam. I just need mangoes! This morning, I faced the daunting task of sorting habaneros, jalapenos, red onions, limes and other goodies – and processing same – in preparation for making the hot sauce and pepper jelly. With boxes of jars for my seasoning, hot sauce and jam stacked in the entry way, our condo already looked like a warehouse. With the addition of of cases of peppers and limes (and coolers to hold them), bags of sugar, large bottles of rum, and other ingredients, our place has become an obstacle course. 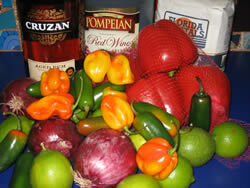 Sunday, I’ll finish preparing the hot pepper mix and squeezing limes, and then I’ll wait for the mangoes to ripen. Eventually, I’ll post the hot sauce recipe on my website. Until then, you can check back here to find out how things are going. And if anyone needs to reach me, send an e-mail or call Bill. PS to NORAD: If you get a message from the Virgin Islands asking you to scramble fighter jets, please disregard. I was just trying to call my mom.